Apostol transforms before our eyes from an innocent teenager to a world-weary mother to a feisty fighter determined to find a better life. The show certainly owes its successes to a great script, strong direction and a wonderful ensemble. But the performance of Apostol as Susan can’t go unmentioned. A strong presence throughout, she nails the climactic moment, an expansive and difficult monologue that charts a huge emotional terrain. Rinabeth Apostol has memorable roles as the helpful Elder who’s always free with advice and as a skittish picture bride traveling to join a husband she’s never met. 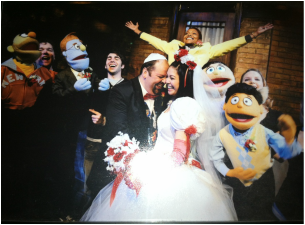 Rinabeth Apostol is a cranky charmer as the church elder, yet she excels as a frightened bride and many other roles. As the more barbarous L, Apostol savors her bloodthirsty lines; it’s as if, in merely speaking, she’s already devouring her planned victim. 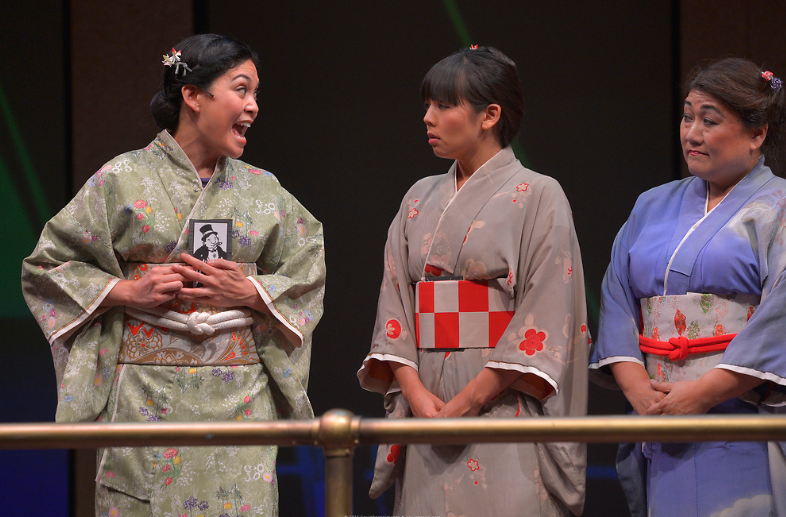 Rinabeth Apostol as L and Tiffany Villarin as M are unequivocally enthralling and both give dynamic performances. Their timing and delivery are remarkable. As the twins, Rinabeth Apostol and Tiffany Villarin, perform at breakneck speed, finishing one another’s sentences and moving in unison, to create an inhuman effect that is simultaneously funny and horrifying. Each of their scenes together is a gem of precise vocal, psychological, and physical choreography. The play features two unforgettable highlights: As L, Rinabeth Apostol performs a lengthy monologue, which is simultaneously presented as an interpretive dance; it is a showstopper. Rinabeth Apostol (“L”) and Tiffany Villarin (“M”) are nothing short of astounding… The two actors are shockingly good as they employ their entire beings in their initial frenzy and fury, their later posturing and plotting, and their eventual dives into final diabolism to secure admission. The Bard would be so proud. 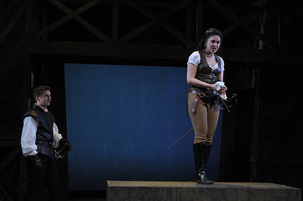 Rinabeth Apostol brings some indignant spark to the role of Cassio's part-time lover Bianca. ​Rinabeth Apostol gives a fine, sensual performance as Bianca. The most broadly-drawn is the hilariously stereotyped Asian social worker Christmas Eve (Rinabeth Apostol), whose imprecision with certain English consonants may not be politically correct, but funny is funny. As Lupita, Apostol offers a more serious performance from start to finish, providing a no-nonsense center for the dreamers who enter her orbit. She, too, has her dreams, and in one the play’s poignant moments, psychs herself up for another “performance” at the club where she dances by repeating the mantra that it’s simply a role she’s playing. From a very non-Disney Middle Eastern princess to a Latino lost teen to a broken-home honor roll student with weed in her purse, Rinabeth Apostol’s performance, differs in character and is first-rate. Rinabeth Apostol (Rapunzel)... brought new life and a grand sense of comic timing to an old fairy tale. Rinabeth Apostol has especially wonderful turns as Amir’s love interest, Soraya, and the hilarious shop owner, Mrs. Nguyen. 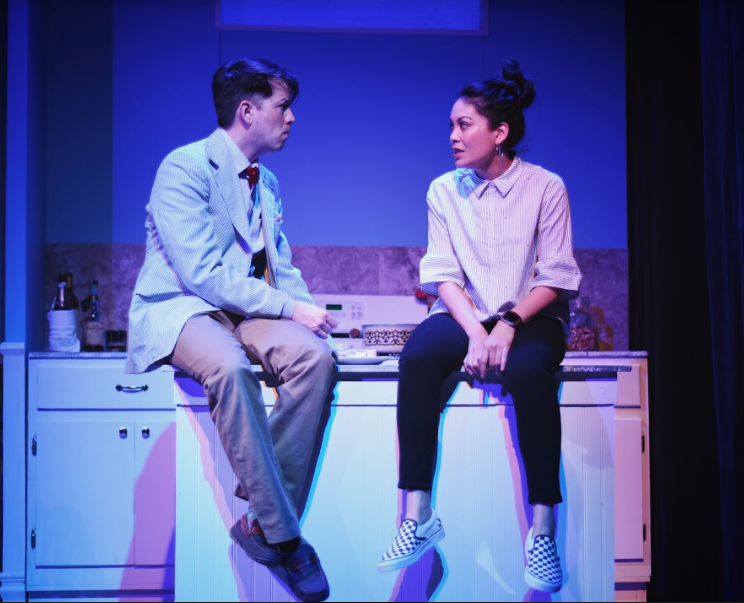 In her characterization, Apostol demonstrates another aspect of theatre’s magic: Mrs. Nguyen is onstage once, with only a few lines, yet she is utterly unforgettable due to the actress’s commitment to the role. 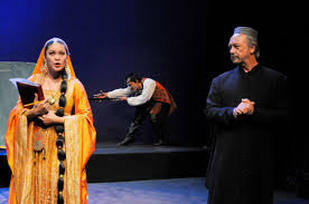 In this male-dominated play that is a mirror Afghani culture, Rinabeth Apostol as Amir's love interest holds her own, convincing us she is worthy of Amir. Usually, a play, musical or opera has a weak link. 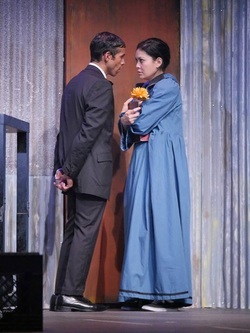 However, the cast of The Kite Runner was uniformly strong with several actors and actresses filling multiple roles. I was astonished that Rinabeth Apostol, who played Soraya, Amir's love interest, was also the comical Mrs. Nguyen of the convenience shop. I have seen her [Rinabeth's] work and like it!